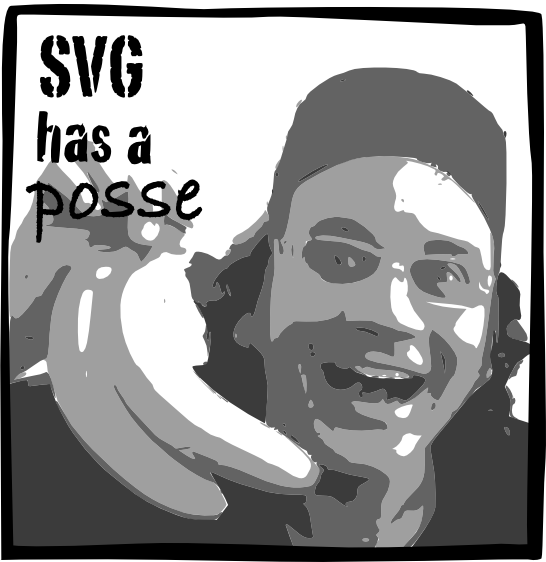 One of the great aspects of working with the SVG community has been meeting some of the cool folks inside of it. I got a chance to meet one of these people, Doug Schepers, recently. Doug is great and alot of fun. He got involved with SVG a few years ago and then spent thousands of dollars out of his own pocket in order to join the W3C as an individual and influence its direction in a positive way. Now he is fully helping to define and steward SVG as a W3C Member, such as with the recent CSS + SVG work going on to use CSS in order to apply SVG effects that Safari submitted. I wrote it in SVG of course, using Inkscape. Click through it to see the SVG file. This is of course based on the famous Andre the Giant Has a Posse posters by Shepard Fairey. If you thought Doug was fun, try meeting some of us SVG outlaws!